When we get the craving for Mexican food, it usually presents itself in the form of tacos or quesadillas or enchiladas, but there are other, less expected options out there. We were getting ready for a friends-and-family game night the other day and we wanted to incorporate those classic Mexican flavors we know and love, without having to make a big meal out of it…enter: cheesy bean dip. 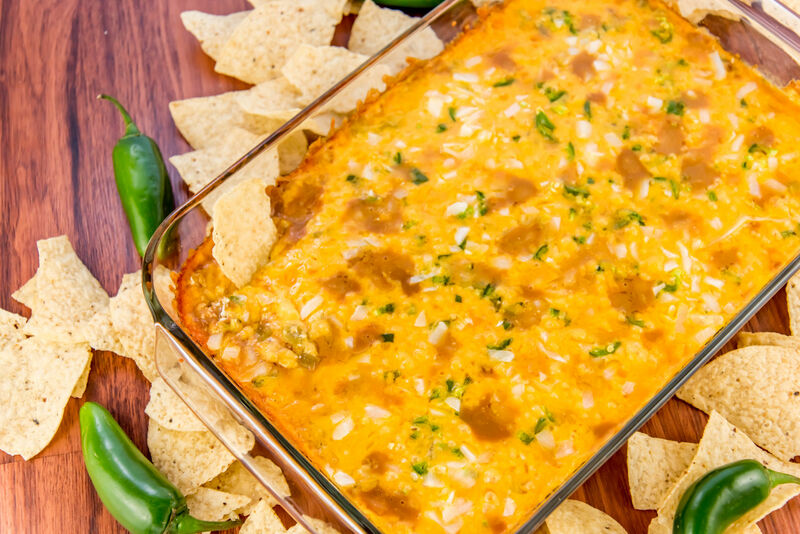 Stuffed with refried beans, green peppers and cheese (naturally), this dip reminds us of all those dishes we love, yet came together quickly and easily and was devoured by the group when we brought it out. They couldn’t get enough of it and neither could we! Heat olive oil in a large pan or skillet over medium-high heat and sauté onions until softened and translucent. 6-8 minutes. Add minced garlic and cook for another 1-2 minutes, or until fragrant. Mix in refried beans, green peppers and cumin, then season generously with salt and pepper. Stir everything together until combined. Remove bean mixture from heat and stir in sour cream, hot sauce, 1 cup cheddar cheese and 1 cup mexican cheese. Transfer dip to a large baking dish and top with remaining cheese. Place in oven and bake for 25 minutes, or until cheese is melted and bubbly. Remove from oven and let cool 5 minutes before topping with minced jalapeño, if using, and serving with tortilla chips.